I guess that a diesel is really work horse. I was always told that lugging an engine, be it gas or diesel, would be hard on the mains. Think that is true? However, were these engines from a vehicle that had an automatic transmission for all of its life? it's NO JOY for engine #2!!! Drained the engine oil and rolled her over. Pulled the pan and son of a gun if there weren't 4 cracks in the bottom end of this engine! I don't know about your area, but here in CT Cummins are not terribly expensive. I've bought and sold VE/VP44 engines for $1K. No cracks in the mains either. OK, I have officially given up on the 6.2. Besides, the truck would sound funny (compared to the original sound) if it had a V8 or diesel in it.... So, I got my hands on a Ford 300 I-6! The thing has the original ford motor mounts on it and they even fit the frame mounts so I don't have to modify it!! The engine is from an'89 model van and has the fuel injection on it. That will be sent to the recycler and an Offy intake with a Holley will take it's place. I pulled the intake/exhaust and ALL the ports were wet. So, rebuild the head, new pistons and rings along with rods and mains. I located a ZF 5 spd trans to put behind it and tie to the original 200 T-case. Spent some time today looking up parts for the 300 rebuild and CRIME!!! That is going to be as much as building a healthy Chevy V8! Oh well, back to saving more pennies! I'll get pictures up soon. Nice. The Ford 4.9 fuel injected engine is bullet proof. Good power and decent mileage and they are easy to work on. Love to see one in a 715. Post up some pictures. Sorry to hear about the prices. Good thing on the motor mounts though. That will make things much stouter and easier. 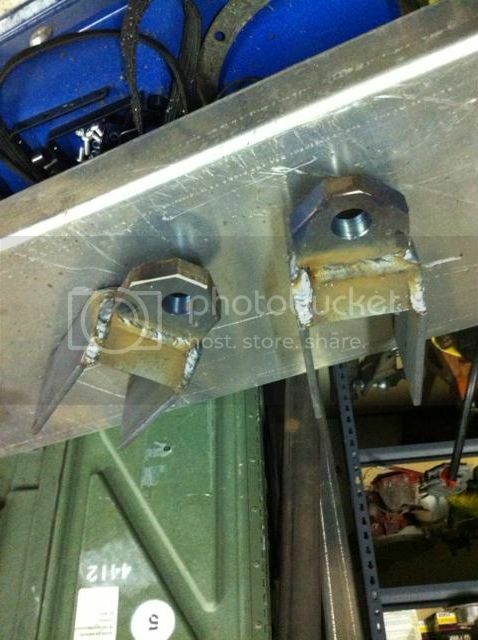 OK, The 300 inline 6 is at the machine shop so, while waiting, I decided to build a pair of tow feet for the old 715. That way I can flat tow it to the sand blaster. 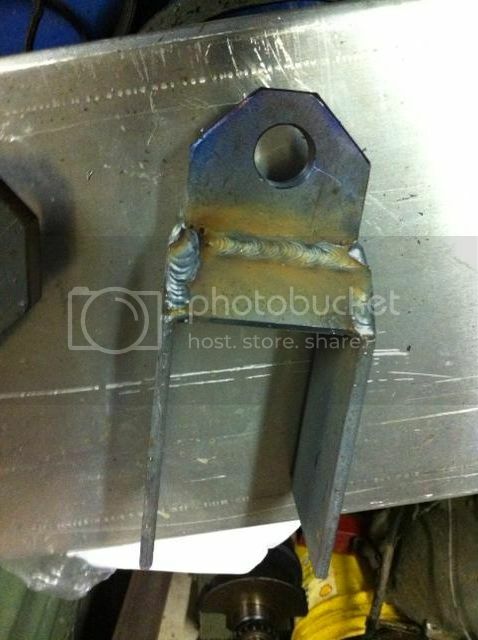 These were cut out, tacked then welded out. I haven't cleaned or dressed them and it was getting late so I just left them to cool over night. 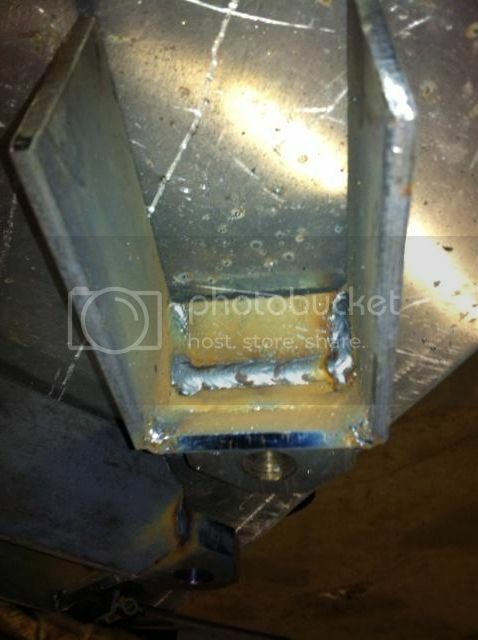 This is the backside of the foot after I welded it on the inside. You just saved yourself 200 bucks or even more making these ! the 300 inline 6 will be interesting, especially with a 5 speed. Good news on the mounts. I've only seen one other ford inline 6 installed, and it looked good ! but they put a dually rear axle under it from something. On my parts truck with a 292, I got it up to about 80 MPH with the stock gearing... and a 4 speed sm 465.
test runs for me require me going that fast on the 2 lane blacktop, or I will get flat run over . The highway is at the end of my driveway, so I have no choice but to floor it, any direction I go. OK, It took a while to find pistons! My machine shop guy has been working helping me build this thing. We shaved the block to true the deck surface then he shaved the head to close the combustion chamber. With the pistons he finally found, the engine should be in the 9.4:1 compression ratio. I located a ZF 5 spd trans that fits a small block. Gotta go get it picked up. Now the T-case is being the issue. I want to be able to get in this and drive cross country so I have been looking for a divorced 205 but having a hard time finding one with a right side drop. Now I'm looking for a divorced 203 that I can mate to the 205 and create a doubler. I've also gotta check into the possibility of finding something that will mate to the ZF. Tomorrow morning, the chassis and bed is headed to the blaster! Chassis will be blasted and painted black. The bed will be blasted and primed. Now I'm getting in a hurry to start reassembling the truck!